25/3/2007 The latest Schizoid Dog strip is now online at this website - click HERE!. The Sledge Dogs have produced a Prisoneresque piece of music, click HERE. 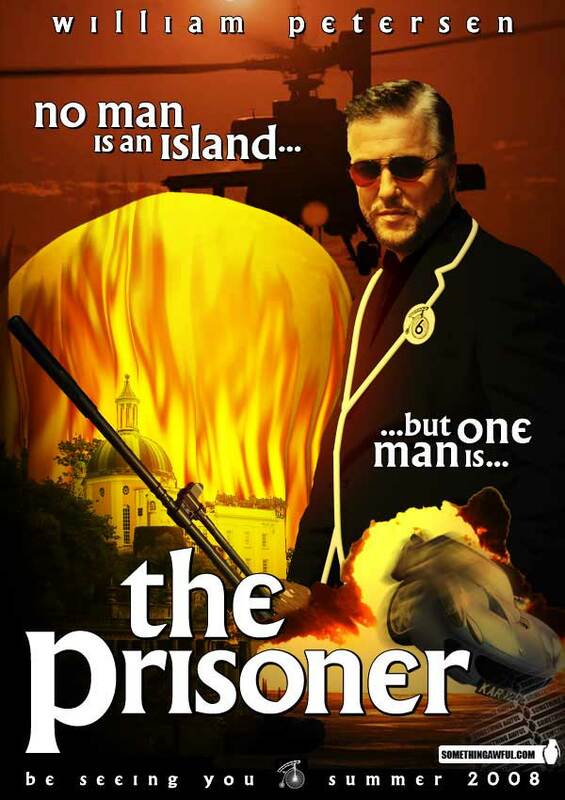 Click HERE to see a spoof Prisoner movie poster curtosy of www.somethingawful.com. 19th March 2007: Happy 79th Birthday to Mr Patrick McGoohan. May the sun shine on you today, and every day! 13/3 BBC America are showing The Prisoner nightly from today, throughout March and April. 8/3/2007 The Prisoner was referenced in today's edition of Radio 4's "Ape Got Lucky"......Scottish readers may want to listen out on the radio for mobile network "3"'s latest advert, which uses a modern arrangement of "A, B, and C's" Dreamy Party music. 24/2/2007; Latest edition of "Private Eye" mentions the Daily Express' 14-month-late reporting of the series remake..."Columbo" 1980s-2000 movies on sale soon in the USA, several featuring McGoohan (news HERE). Amazon are selling a Danger Man megaset for under $100 (NTSC). 13/2/2007; On 14th Feb Portmeirion joins Tesco Club Card Deals. Patrick McGoohan stars in Columbo episode "Identity Crisis" 19/2/07 on C5 at 1.30pm. 2/2/7 Amazon are again selling the first Prisoner Scripts Volume discounted. Details HERE......A human chess game takes place, details HERE. "Three Lives for Thomasina" starring McGoohan; BBC2 TV (UK) ~10:30 Wed 3 Jan 07. 6/12/2006 on Channel 5 - "Columbo - Last Salute to the Commadore" starring Patrick McGoohan, at 3.15pm. 8/12/2006 on Channel 4 at 9.00pm - "The Computer Wore Menace Shoes", Prisoneresque episode of "The Simpsons" with McGoohan guest voicing. The Columbo episode "By Dawn's Early Light" Directed by and starring Patrick McGoohan on Channel Five on 15/11/06 at 3.30pm and PMcG in "Man in the Iron Mask" is on Channel 4 on 16/11/06. Page 270 of Alan Moore's "V for Vendetta" comic cites The Prisoner as an inspiration. Click HERE to hear a Radio Interview with "Prisoner" author Cathy Frumerman. Click HERE to read interviews with "Prisoner" actresses Jane Merrow and Annette Andre.